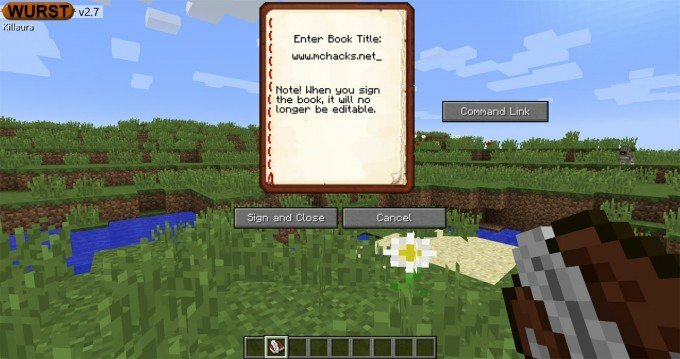 On some servers, you can force yourself to get OP (Minecraft server operators) commands – this can even be done without hacking or doing anything illegal. This is also a reminder for Server admins to watch out for. People can use this to griefing on servers, trolling players or granting themselves OP rights as mentioned before. With the BookHack method, it is so easy that almost anyone can do it. There are several clients you can use for this, in this guide we will teach you how to do it with the Wurst or Wolfram client. First, craft a writable book (Book and Quill). Type some text into it – it doesn’t matter what you write. Click “Sign” and give the book a title. Chose the mod menu “Other Mods”.